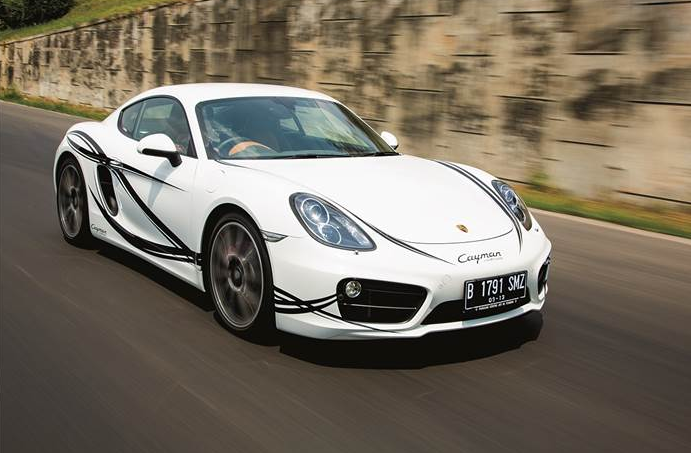 We still do not know for sure, why this car called Porsche Cayman. Crocodiles that live in the interior of Central and South America. No, this car is not named after the Cayman Islands, but the crocodile was the basic of its name. But anyway, at this time, you're looking at the beauty of the Porsche Cayman S is actually built as a variant of 'hard top' of the Porsche Boxster. Yes, you read that right. It is a roofed version of the Boxster which we have tested some time ago. Cayman was introduced in 2005 with a 2.7 liter engine or a 3.4 liter configured 'straight-six' (boxer). Over time, a 2.7 liter engine to 2.9 liters changed, and as the cover of the first generation, appeared Cayman R is the most powerful. We so love the Porsche Boxster S we tested the experience of the car. Big name Porsche should ensure the quality of this car, and the engine and the interior is exactly the same, it should give the Cayman S also offers equally good. Compared its generation before, transformation is fairly thorough, if counting Porsche always careful to redesign its products. Headlights with b-Xenon, and a different shape design, change the position of the 'driving light', complete with a line at the edge of body. Effect of hyper car design Porsche 918 was correct in this section, although the Cayman has a higher stature, larger fenders, and sloping roof over the rear. Changes in dimensions, although at first glance looks similar to the previous generation, also occur. His body is about 33 mm long. The width is unchanged despite the distance of departure wheels widened 40 mm in front and 12 mm at the rear. In addition to posture 11 mm lower than before, using 20-inch alloy wheels as used by our test car, the Cayman looks more manly and 'fierce'. 3.4-liter engine is the standard Cayman S, is placed between the rear axle and cab (mid-engine), as in the Boxster. 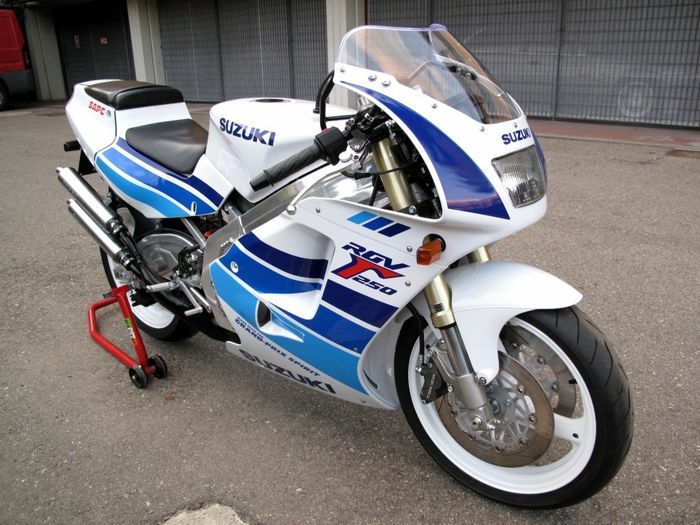 The maximum power produced is 320 hp with 370 Nm of torque. This machine, as well as the 2.7-liter engine, has been equipped with VarioCam, ignition and valve technology settings typical of Porsche. Despite large capacity, the Porsche Cayman has been claimed fuel consumption of only 12.9 kpl. 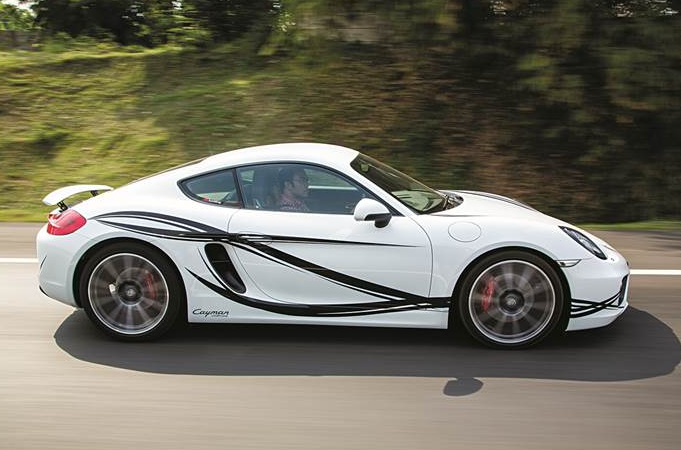 We noted during the test as far as 90 km route combinations, the Cayman S to drink as much as 9.1 kpl fuel. Good results for a six-cylinder sports car. Various technologies to curb fuel use pinned in this car. Call it a better thermal management, and features automatic start / stop. Porsche claims that with these features, the Cayman S is more efficient 15 percent from the previous generation. As the successor power, Porsche gave two options. The first is a 6-speed manual, and that seemed like the most popular, seven-speed PDK (Porsche Doppelkupplung) yanhg development is carried out with transmission maker ZF. Cayman tested here have options ranging from full leather upholstery, leather-clad steering wheel, and so on. But certainly, the interior feels relieved. More sloping windshield give the impression of relief and expand visibility despite the low seat position. Additionally, you will not find so ergonomically designed interior in any sports car. The placement of the buttons and especially the gear lever close to the steering wheel, ease of operation. But one thing is rather annoying is the levers behind the steering wheel. In the lower left is controlling the cruise control, and on the right there is a MID control, which, they need time to understand. But it was all replaced with a nice driving position and quite flexible. By placing the engine in the middle, Porsche gave up 425 liters of luggage space with two luggage space. Turn the key, and listen for growling boxer engine for the first time. This machine from the outside is not exactly silent with the rumbling sound of the valve and the radiator cooling fan. However close the door and you seemed to be in another world. That only the sound of 'mumble' engines while stationary. Gearshift is smooth, accurate steering rotation and light at low speed. However, the transmission shift response while doing 'kick-down' was accurate and not excessive. The suspension feels hard though, because this is a sports car, but it will not make you sick. That makes a little irritated, are 20-inch alloy wheels with the thin profile. In short, imagine the convenience when you're driving a Mercedes-Benz C-Class in urban areas. C-Class is equipped with a sport suspension and 20-inch wheels of course. One more thing, the PDK transmission is equipped with features such as the Boxster S. Coasting Transmission will break the connection with the engine when the accelerator is lifted, and the car will slide with engine idle rotation. This is useful to reduce fuel consumption, even when both are connected back, felt a little beat. Placement boxer engine configuration in the middle of the car is a brilliant solution for stability. In the Boxster, because the canvas roof from the outside a little roar permeated the cabin. While in Cayman, the sound will be much quieter cabin. But all that changed when the Sport button near the gear lever is pressed. Sudden exhaust sound more audible, and when the gas pedal is pressed deep, as free-flowing power to the wheels, and your back will feel nearer to the fire wall (engine room divider wall and the cabin). We think, this extraordinary fashion before realizing there Sport Plus button on the bottom (which also means the car is equipped with the Sport Chrono Package option). Press the button, and feel the sensation was twice as great. Harden the suspension, steering into the perfect weight, and response of MDD was more aggressive. . And her voice, it sounds great machine. The same thing applies in the Boxster S. But you need to remember that there are differences in the robustness of the chassis, where the Boxster without a roof, forcing Porsche to strengthen the bottom of the car, and produces chassis 'rigid'. Controlingl in this mode feels 'champion' for PSM (Porsche Stability Management) were more active, and make the Porsche Active Suspension Management (PASM) is more robust. Become heavy steering feels a response that makes We are confident devour sharp turns at speeds above 60 kph (we tested it on the highway). 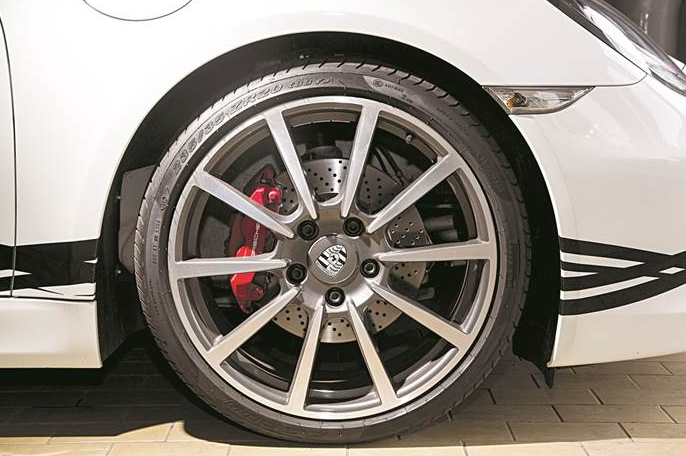 20-inch alloy wheels contribute to providing abundant grip to devour pavement. When running above 120 kph, and a rear spoiler will stand up to give a better aerodynamic effects, so that the Cayman has a stranglehold over into the streets. We feel somewhat shifted the front (understeer) when speeding while devouring a long bend in the highway, but once again, the Cayman S gives a clear input so that the driver knows what to do. And just a little correction on the gas pedal and steering wheel, Cayman able to follow it well too.